Some More Candy Treats to Tempt Your Valentine! In our last blog post we highlighted three oh-so-sweet recipes that are perfect for Valentine’s Day. Each incorporated at least one candy favorite to take an already-enticing baked good to the next level. Today, we’re going to add 3 more goodies to that list. We keep finding amazing recipes, and simply have to share them with you! Of course, the more treats the better, so feel free to try your hand at all of them. And if you have any extras and happen to be in the area, we’d be happy to help them disappear! 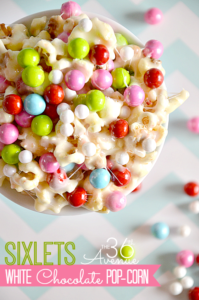 Festive White Chocolate Popcorn – It looks as though the author of this recipe actually whipped up this yumminess for Christmas, but we think it looks perfect for Valentine’s Day as well (especially in those ADORABLE striped bowls!) There is nothing in this recipe not to love, and for as eye-catching and pretty as it turns out, it sounds quite achievable even for a kitchen novice. 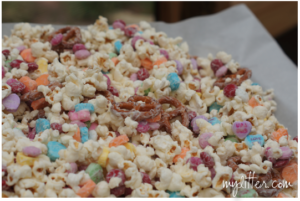 All you’ll need is popcorn, white chocolate chips, marshmallows, butter, corn syrup, and Sixlets. And an appetite for awesome treats. You’ll need that, too! Heart Shaped Peeps Valentines – These so sweet Valentines are not only unique and full of delicious delights, they are also so easy to make that you don’t have to ‘make’ them at all. Instead of a recipe, there are simple directions. 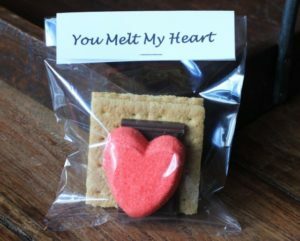 Simply place a graham cracker or two in a treat bag with a piece of a Hershey’s bar and heart-shaped Peep. You can give your Valentine just one, but they’re sure to want s’more! 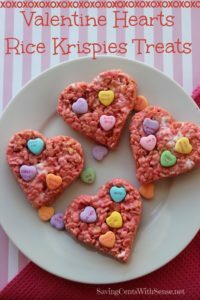 Conversation Hearts Rice Krispies Treats – Whether you’re mixing up Valentines for the kiddos, or your special someone never grew out of Rice Krispies treats (who could blame them? ), these heart-shaped eats are a perfect snack for sharing the love. 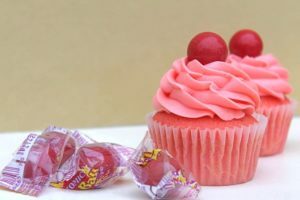 This recipe calls on red food coloring to give the hearts a light pink hue, but you could always make several small batches and incorporate blue, green, purple – whatever your ummm… heart desires! Grab a bag of Necco Sweethearts, and you’re done in a flash. 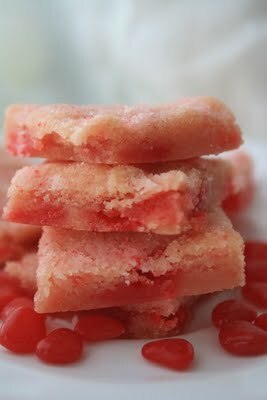 Candy + Baked Goods = Happy Valentine’s Day, Indeed! Cinnamon Imperials Shortbread: May a million blessings come to the woman who dreamed these up! While I haven’t had a chance to try them out yet, as a big fan of Cinnamon Imperials and shortbread, I just know they’re going to be fabulous. Honestly, how could they not be? Just look at that beautiful, buttery shortbread! Yum, yum, yum. White Chocolate Popcorn & Conversation Hearts: How much do I love white chocolate, popcorn, and Conversation Hearts? Enough that I’m not even sure I can make this one because I fear I won’t stop eating until it’s all gone. And because I fear that no other dessert will ever live up to its awesomeness. And because I fear that – oh, who am I kidding – a life lived in fear is no life at all! I’m making it. And you can bet I’m making a double batch so other people can eat some, too. If they’re quick enough.